The fall has been a busy and productive time at the Gallery. A number of newly printed pieces are hanging on our walls. There are some large color prints from the east flowing rivers in Olympic National Park that were made to support the Wild Olympics Proposal, a current bill before Congress to expand the protection of lands and streams around the Park. We are also showing some new silver gelatin figurative work, produced with the collaboration of some of our favorite models. You know who you are. The darkroom printmaking process is going strong here with a good supply of hoarded film, paper, and chemistry. We are pleased that the manufacturers are still supporting the traditional printmakers of the world. In September, I had the privilege of being asked by the trustees of the Dody Weston Thompson archive to print some of Edward Weston’s negatives from the 40’s. It was a thrill to take a vintage negative out of a box and watch it come to life in a printing tray. Dody was an accomplished artist, married to Brett Weston, and was Edward’s main darkroom assistant during his later years. A print from this series will be on display in the Gallery. On September 1st we had a nice article published about the Gallery in the Bainbridge Island Review. We thank the journalist, Luciano Marano, for his fine work. In September, I took a trip into the Selway Bitterroot Wilderness Area, my favorite place in Idaho. It was around the time of the 50th anniversary of the signing of the Wilderness Act and the Selway Bitterroot was one of the very earliest areas to receive this level of protection. 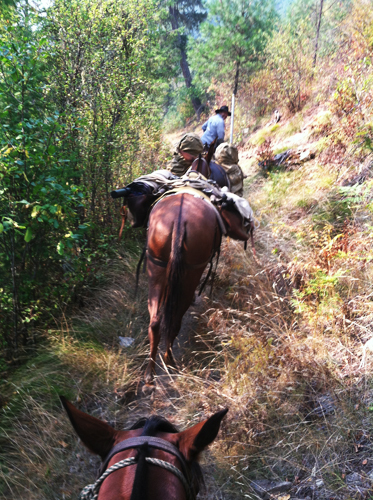 We went in on horseback this time but the photography was tough because of dense smoke all day from the wildfires raging all around us. We thank the folks at Lochsa River Outfitters for packing me and my gear safely up the trail. 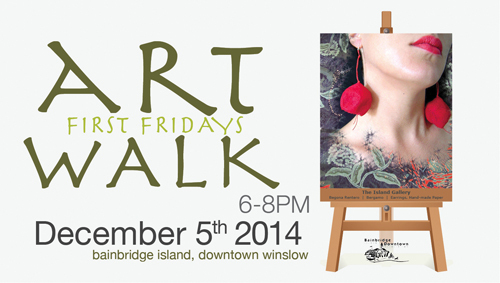 We will be open for the First Friday Art Walk on December 5th which is sponsored every month by the Bainbridge Downtown Association. This month we will be joined by our friends at Washington Wild, a local conservation group, who will host a table in the Gallery featuring information about the Wild Olympics Proposal (see this Bainbridge Review article for more information). We hope our visitors can get educated about the proposal and decide if they would like to support it as it moves through Congress. Finally on the December Art Walk night, our neighbor gallery, The Roby King Gallery, will be showing the prints they curated and displayed for the past 4 months in the Governor’s mansion in Olympia, including a few pieces of my work. The prints are all from local photographic artists featuring mainly topical Washington images. Stop by and visit them if you can, and check out this recent article about the exhibit.